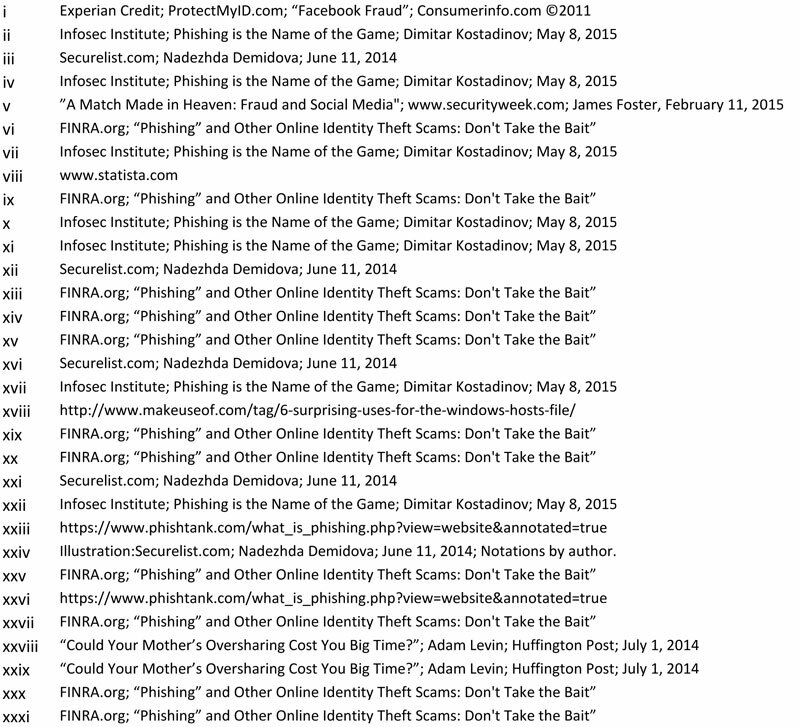 Fraud and Social Media: Phishing for Data | Shapiro Financial Security Group, Inc.
Shapiro Financial Security Group, Inc. According to Experian Credit’s ProtectMyID.com, social media is ‘a new venue for old frauds’. The old fashioned ‘confidence man’ has gone online. Social network sites encourage us to share the details of our everyday lives. We feel that because we build our networks around our families, colleagues and friends, we can trust the communications we receive via these sites. Unfortunately, cybercriminals have moved in to exploit this trust and serve their own nefarious purposes. These attacks can occur on any device that connects to the internet - computers, mobile phones and tablets and via any application - email, social networks such as Facebook, LinkedIn and Twitter, mobile phone apps and company websites. All are vulnerable. ‘Phishing’ in which online attempts are made to steal personal and company information. Malware infection in which malicious codes such as viruses, worms, and Trojan horses are injected into the computers’ operating system. As with phishing, we are more likely to download/open files that come from our friends therefore exposing us to infection with codes that are designed to track online activities and give access to ID’s and passwords. Although it would seem that hacking into Facebook or other social sites would not bring monetary rewards, it actually opens opportunities that eventually do bring profits. In the first quarter of 2015, Facebook had 1.44 billion users worldwide with 210 million of them in the United States and Canada. [viii] With this level of popularity, the opportunities for cybercriminals are vast. We are going to look at phishing in depth as it is usually the gateway into the various criminal schemes and is the point at which we, as consumers, can protect ourselves most effectively, if not completely. Phishing is an attempt to steal your identity via the use of various scams. The most common of these attempts are made via emails that claim to be from a well-known company or known person. Other attempts are made via malicious pop-up windows on websites and by ‘spoof’ or fake websites. An account will be shut down if the victim doesn’t respond. Due to a technical update, the user needs to reactivate or update their information. Quizzes, colorful banners, surveys or giveaways are all used as lures to catch ones’ attention. False emails purporting to be from a social network or business that seem to come from real email accounts. Messages in social networks that are sent from fake or hijacked accounts. Messages sent from compromised legitimate email accounts to their associated address lists. Your first defense is your own common sense. The Verizon study noted that more than 50% of recipients open a phishing email within the first hour, 23% at some point and 11% open the attachments. [xxii] If you have any concern over an email with an attachment or a link, DO NOT open the link or the attachment. Delete it. Phishing websites and emails are often poor in quality as they are designed to be transient. If the quality of a logo or the text strikes you as poor, be suspicious. [xxiii] The grammar or spelling may also be incorrect. Leave the site immediately and run a security scan on your device. Keep your computers’ anti-virus and firewall protections up to date. Consider using an anti-malware program such as Malwarebytes.com. to periodically search for undetected malicious code. Before clicking any link, banner, following a page, or opening an attachment, always check the web address and the sender’s email address. Roll your mouse over the link to read the URL address. Pay attention to whether there is a secure connection – Facebook, LinkedIn, and Twitter all use the HTTPS protocol to submit data. A small padlock symbol - - in the browser bar also tells you that the site is secure. However, while even the presence of the https and the padlock may not guarantee the safety and authenticity of a site, the absence of a secure connection, even if it is the correct address, does mean that the site is not secure. [xxv] Always be sure that the site shows the https designation before submitting any data or engaging in any type of transaction. Often cybercriminals will use words resembling the actual site’s address, but the real site name is at the end of the URL. Sometimes, the entire address is different. Avoid clicking on the ‘Unsubscribe’ option as well. 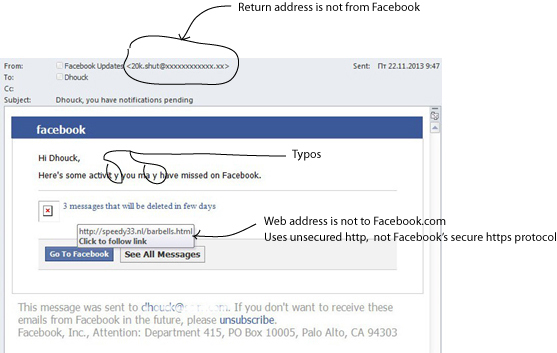 This is another route for collection of your information as it verifies your email address as legitimate. Unfortunately, this is not infallible - these criminals now have figured out how to bury technical code behind the link, thereby making it almost impossible to detect.[xxvii]. Research with whom you are doing business before opening any account or submitting any personal or business information. Research the firm’s professional memberships and look at the organizations’ credentialing bureaus to be sure the company is legitimate. For personal contacts, if the tone of the message appears out of character or too generic, be suspicious and don’t click through until you have verified the contact personally. Make up a birthdate – you won’t get birthday wishes on your special day, but identity thieves will not get it either. Post your location using a region rather than your town. New York City rather than Ocean City. Ignore Facebook’s constant request for more information to ‘complete your profile’. Avoid posting the name of your childhood pet, your mother’s maiden name, the street you grew up on or any information that you may use to answer a security question on a legitimate site. Unfortunately, it is not possible to completely protect yourself online. Identity thieves and other criminals work overtime to come up with new ways to get around the protections that are available. However, the more educated and aware we are as consumers, the better chance we have at minimizing our chances of being harmed.